Iraqi-British architect Zaha Hadid has done it all. From dancing skyscrapers in Dubai to hidden Russian bungalows, from aerodynamic couches to aqua tables, she's brought her signature curved line to almost every nook and cranny of the design realm. And now she enters the world of superyachts. 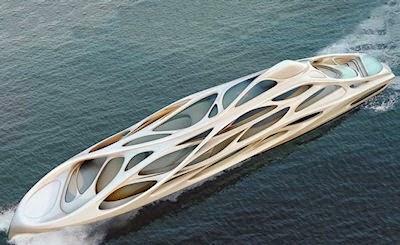 Hadid has designed what very well might be the ocean's answer to today's bevy of vertical fetes of impossibility. The 420-foot yacht, created for Blohm+Voss, is a white monster of a boat, adorned with a sinuous exterior that blows the standard cockpit design out of the water.